I would like to add an option to change class on an image that is inserted into the RTE of the content item. In particularly I would like to add bootstrap class "img-responsive". Nothing shows up in the RTE. What have I missed? Pointing to the entire bootstrap.css is a bit overkill. (And I suspect Sitecore / Telerik is having a hard time parsing it.) What you should do is ignore the ToolsFile.xml entirely (make sure the <classes> element is empty), and point the WebStylesheet setting to a custom CSS file that only includes classes that should be exposed for selection. You could also add your editor-specific styling in there, or you could use the technique described in this blog post to add other CSS files to the editor. An important point here is that the RTE in Sitecore hasn't been getting much love. One issue you'll likely run into is that if you right-click your image and select "Properties", the CSS class list in the dialog will be empty. I've never been able to find a workaround for that. Other elements like tables and links work as expected. Let us know if you figure out a fix. Meanwhile, the "Apply CSS Class" dropdown which is part of the toolbar at least works as expected. Finally, you can still set your classes in ToolsFile.xml, which will allow you to present user-friendly names instead of direct CSS class names. But then, you will need to keep both CSS and XML in sync. For the RTE in Sitecore (Telerik RadEditor), it's a one or the other type of scenario. So, you can either use the "WebStyleSheet" setting in Sitecore, or you can modify the RTE's ToolsFile.xml to add your own custom classes. I have a blog post about this here. I suspect this may be your issue. Also note that if you modify the ToolsFile.xml file, you will likely run into issues when you perform a Sitecore upgrade, because the file may get overwritten. 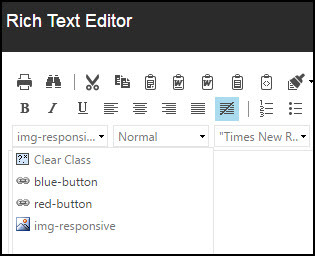 In my experience, it is better to generate a style sheet specifically for classes needed in the RTE, use the "WebStyleSheet" Sitecore setting to load that style sheet, and not touch the RTE's ToolsFile.xml. This will just append an additional pipeline onto the SaveRichTextContent Processor. Then use the code below with the HTML Agility Pack to add/remove the html you need on the images added via the rich text editor. Not the answer you're looking for? Browse other questions tagged richtext-editor or ask your own question.